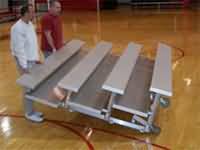 IMPORTANT NOTE: To paraphrase a national building code any bleacher with a seat height in excess of 30" from the ground must be enclosed with some type of guard that will prevent a 4" orb from passing through any open space above 30". 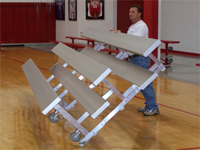 Bleacher companies commonly use either a chain link guard rail system or picket guard rail system to accomplish this, however in the case of tip and roll bleachers the added weight of these guards would render the bleacher too heavy and awkward to easily maneuver. 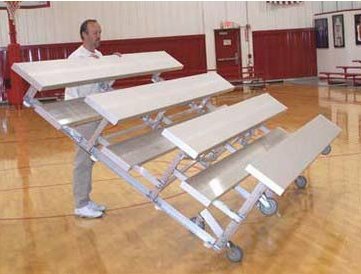 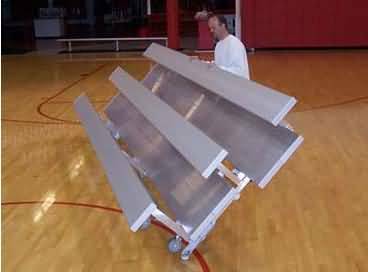 Therefore, our Standard 3 row tip and roll bleachers are the tallest standard bleachers available, a 4 row tip and roll bleacher is available only in low rise models.